In spite of extraordinary performances from Jamie Bell and Anette Benning, we didn’t like the Film Stars Don’t Die In Liverpool much, so the discussion ranges from the why of this to who Gloria Grahame was, film noir, why so many fading film stars marry gay men, and what it’s like to watch films at the Electric Cinema. Mr. Holmes is of such paralysing dullness one is rendered too inert to walk out of the cinema. Thus, one ends up appreciating the excellence of Ian McKellen’s very subtle and complex performance; remarking once more on what a fine and underused actress Laura Linney is; noting how Frances de la Tour is now so broad in everything she does that she serves as a destabilising force field to any work she’s in rather than as an actress; and lastly one mourns how Frances Barber seems doomed to always be wasted. Bill Condon directs as if for an important and prestigious BBC show where everything is rendered obvious, underlined by voice-over, all at a slow and portentous pace. 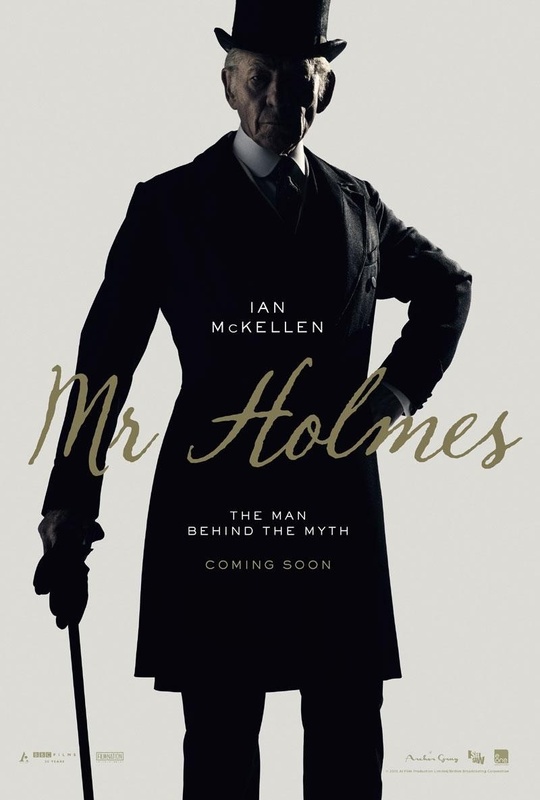 Mr. Holmes is a ‘serious’ film and great thought and care has been taken as to its form and structure. It has a great premise: Holmes is old and getting senile. He retired 35 years previously because of a case and can’t remember it. Watson wrote it as a great success but was it? What made him retire and how will he find out now when he’s often not altogether there?As he tries to find out, we flashback to the past and his relationships with Mycroft and Watson who we see as vaguely as he remembers. There’s also something that happened in Japan that affected him and that he might have dealt with badly. The dramatisation of his cases in the cinema offers another perspective and potential clue. There’s also a relationship with his housekeeper’s son, a young boy who she wants to put to work right away rather than get the education living with Holmes can provide. Overhanging all is an important difference between bees and wasps used both as a clue and as a symbol. It’s all intelligent, literate, tasteful; yet, aside from the contributions of McKellen and Milo Parker as the young boy, also lacking in spark, drama, motion, life. Visually, it’s disappointing with the quality of the image lacking depth and texture; and with those sharp outlines, clear colours, and thin texturality one associates with digital. A film that seems to diminish even the very Cliffs of Dover.